Why chandeliers? Honestly it began as my way of “checking in” at the many locations I frequent in my day to day travels, on and off the job – Board meetings, networking events, client offices and weddings. I am slightly OCD and I feel the need to account for my time at these locations, but in a unique way. This fuels my love of symmetry, made visible by these photographs. Entering a room, we view chandeliers from the side, so why this particular angle? I became enthralled with the view on a trip to Europe in 2000. I had decided to not travel with a tripod, to save on weight and not look like the typical “sandals and Hawaiian shirt tourist”. As I visited so many of the amazing cathedrals and palaces, I found myself wanting to get some images. The detailed views were often dark and difficult to get a useable image inside. I had to get creative. Placing my camera on the ground, facing up. With a wide angle lens, I was able to capture a long exposure of the ceilings. Reviewing the images, I was able to truly appreciate the artistry, architecture and details we so often overlook. The additional bonus of these images… they had no people to distract from the beauty of these historical locations. Upon returning home, I began to notice this beauty in the many churches and buildings I was working in. Consciously I began taking the same shots to document my local travels. It becomes a game with friends in attendance, to try and figure out which lights I have captured. The overhead images are often much more abstract. The fixture can look vastly different, from underneath, than the side view would afford. 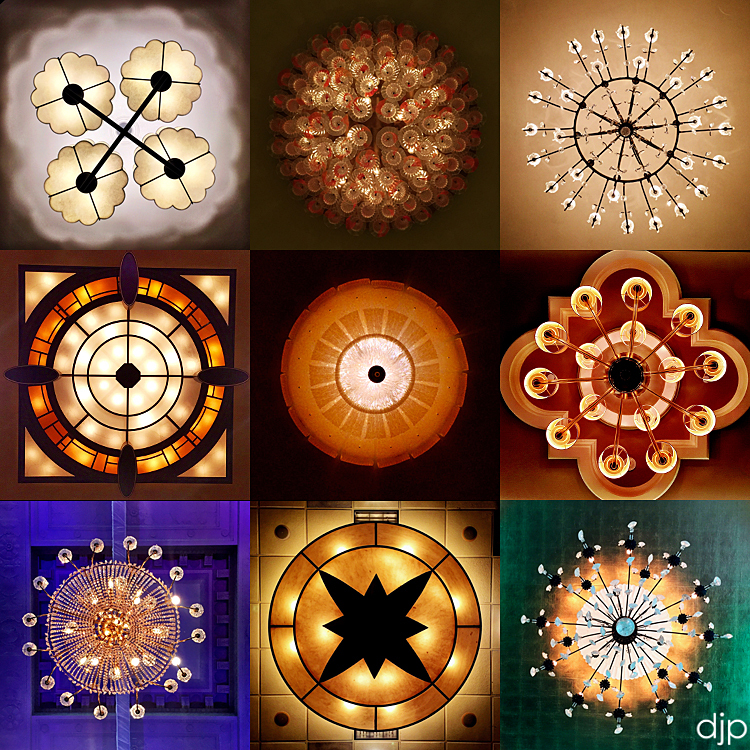 Some of the more intricate chandeliers take on a whole new look when simplified to a two dimensional plane. Surprisingly, ha ha, you may not realize that I am naturally shy and a somewhat introverted person. I find my comfort behind the lens, as opposed to being in front if it. While most people are documenting their adventures with selfies, I am less inclined to be part of the photo. As a group, we look at the number of likes we get on social media. We allow that to be the gauge of our work, but it’s not. I may not see a lot of “likes” but I am always surprised by the number of friends, colleagues and clients that have been moved by my Lust for Light series. Often times they will share their own chandelier images from vacations and even a few have done so on their honeymoon, with a tag in joking homage.